For the WikiLeaks truck to be parked at Fort Meade on the first day of the Bradley Manning court martial is a bit of performance art that reaches new heights of irony: WikiLeaks is the media organization which received Manning’s anonymous transmission of documents and video related to the wars in Iraq and Afghanistan. For a hypersensitive military, which bans its personnel from viewing anything remotely related to WikiLeaks, it’s a symbolic slap in the face. It isn’t exactly as if Julian Assange himself is attending Manning’s court martial–the truck isn’t sanctioned by WikiLeaks. It became a familiar sight, though, throughout the Occupy Wall Street demonstrations as artist Clark Stoeckley’s way of drawing attention to Bradley Manning’s situation. Official or not, the WikiLeaks logo and the words “Top Secret Mobile Collection Unit” emblazoned on the side do have the strange ability to unsettle authorities. Stoeckley was driving the truck near the White House in March 2011 when the Secret Service pulled him over for the fabricated reason of driving in a “no-truck zone.” In November 2011, the NYPD confiscated the truck and temporarily lost it. 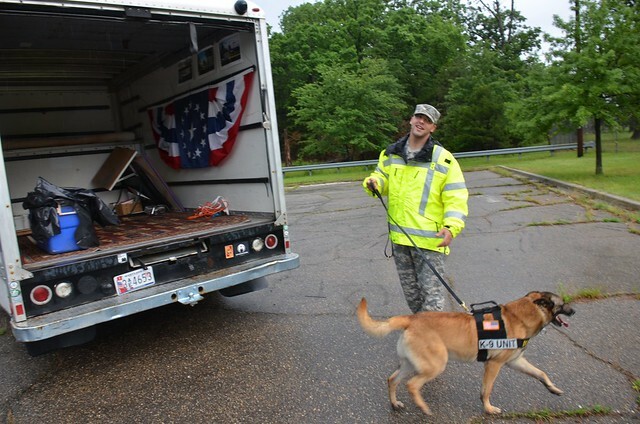 Today, Stoeckley had official clearance to enter Fort Meade, regardless of transportation. After a K-9 search, the truck got the green light to park on the base, and Stoeckley took his place among media covering the trial. He’ll draw courtroom sketches, as he has for the pre-trial hearings. You can see Stoeckley’s sketches in his newly published book, The United States vs. PFC Bradley Manning: A Graphic Account from Inside the Courtroom. UPDATE via Rob Brune: “The MP dog pissed on Clark’s cooler in the back. The MP apologized, but I’m sure he and the boys on the base are having a good laugh.” I prefer to think of it as the signal for passing a security check–or even the K-9 official seal of approval.